Summer along the Kamogawa river in Kyoto is always busy. The Gion festival with its various preparations takes place during the rainy season and tourist numbers are always large to see this. Locals as well as tourists make great use of the river banks for cycling, casual evening walks and also dining. 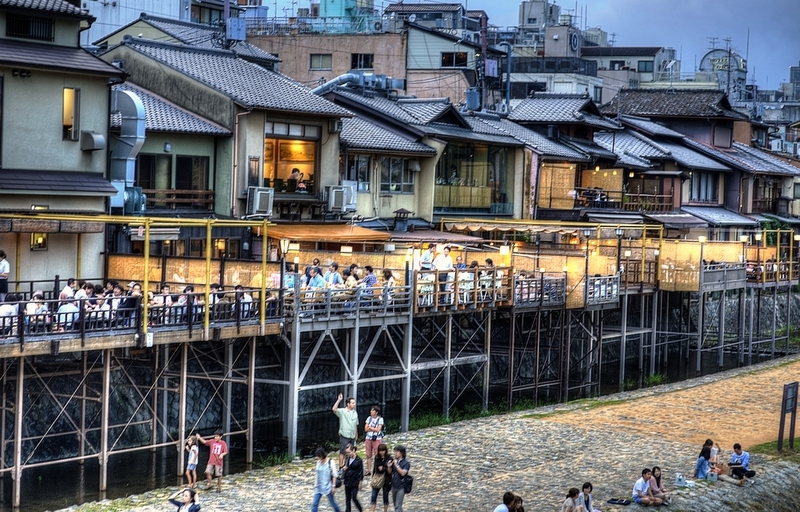 The “yuka” platforms seen above are a tradition in Kyoto dating back over 400 years. They are set up around the end of Spring and taken down after Summer. The restaurants along Ponto-cho are keen to set up the yuka and have customers relax enjoying the cool evening breeze and the view of the kamogawa whilst serving them great food and drink.